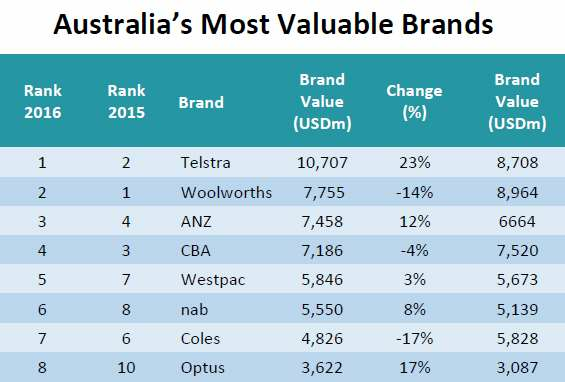 Telstra has overtaken supermarket giant Woolworths to become Australia’s most valuable brand. Woolworth’s brand value dropped 14 percent since last year, while Telstra’s value jumped 23 percent, according to independent brand valuation company Brand Finance. Telstra came in second last year just behind Woolworths. “As flagged in last year’s result, Telstra is now Australia’s number one brand despite increasing competition especially in the mobile division,” said Brand Finance managing director Mark Crowe. The telco’s overall brand is valued at US$10.7 billion, which is based on factors such as familiarity, loyalty, promotion, marketing investment and staff satisfaction. Telstra’s rival Optus also cracked the top eight this year with a brand value of US$3.6 million. The rest of the list was dominated by the big four banks ANZ, CBA, Westpac and NAB taken the third to sixth places, respectively. Woolworth’s rival Coles came in at seventh. Brand Finance will release its top 100 Australian brands report later this month. 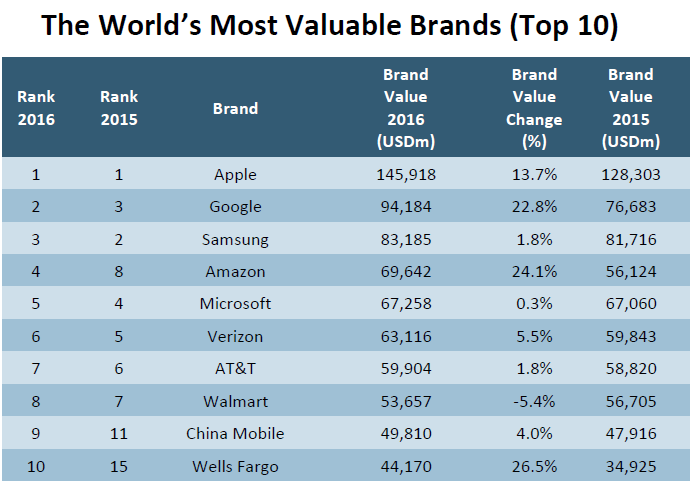 The top 100 most valuable brands lists includes 26 technology and ICT companies, with Apple taking the top spot again. The top seven spots are all taken by tech and ICT companies, which includes No. 2 Google, No. 3 Samsung and No. 4 Amazon. Telstra came in at No. 110 globally, up from No. 145 in 2015. Based on enterprise value, Google’s holding company Alphabet is the world’s most valuable company with combined share classes worth US$555 billion, compared with Apple’s value of about US$534 billion.